The FreeMotion 750 Interactive treadmill offers an advanced incline / decline deck, plus a large AC motor, and a wide selection of programs and entertainment features. The 8" display tracks speed, time, distance, incline, pulse and calories burned. When you use programs in conjunction with the iFit Live Technology, every hill, flat, or downhill segment of your run is simulated on the screen as the treadmill automatically adjusts up to a 15% incline and -3% decline. UPDATE: The 750 Interactive is no longer being sold. Check out all of the most popular FreeMotion treadmills on sale now at Amazon for a comparable model. The FreeMotion 750 Interactive treadmill has a smooth running powerful 3.25 CHP brushless AC motor. 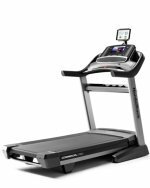 Other technical specs include 2.5" precision-machined rollers, a 2-ply commercial-grade 20" x 60" treadmill belt, and an air-based shock cushioning system. The EasyLift hydraulic system helps the user lift the deck up to the lock position giving you more space in your room when the treadmill is not in use. Other cool features of the FreeMotion 750 treadmill are the 12 mph max belt speed with easy one touch controls, 24 workout programs, the 15% incline to add challenge and variety to your workouts, and the -3% decline which helps to activate different muscle groups and develop leg strength. The music system includes a plug-in port for an MP3 player and speakers with 3" high excursion drivers. The iFit Live technology is installed but is optional (a subscription fee is required). You can use iFit to access training workouts with Jillian Michaels as well as programs using Powered by Google Maps™ - a virtual experience for exploring trails and streets all over the world. The FreeMotion 750 Interactive treadmill has the same red flags as other ICON products offering iFit Live and trying to offer too much entertainment to attract buyers. According to reviews, there are a number of issues involved with iFit Live that the company doesn’t mention up front (it won’t work with Macs, for example), the wireless connection can be dodgy depending on your home network’s connection speed, it requires frequent updates of the firmware, and the ifit.com website isn’t user friendly. 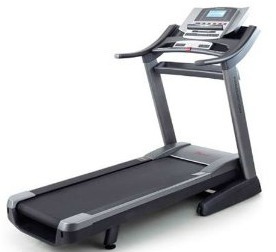 Other than paying for iFit Live that you may not want to use, this is an okay treadmill for around $1,230.